Alto Bonito Elementary held their annual Veteran’s day program on November 11, 2010. Veteran’s day becomes the focus of our learning community, reflecting on the significance of why we honor our Veterans. Alto Bonito Elementary includes the Veterans as part of their celebration by having them walk around the halls while the students cheer them on and give them the honor they deserve. The students are able to meet and greet the heroes of their community and learn first hand from listening to their experiences. 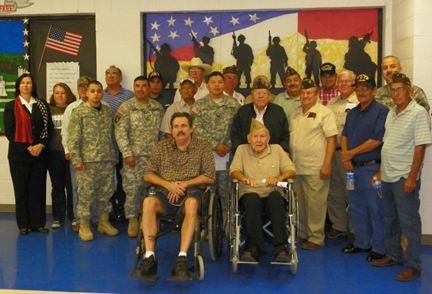 Pictured above are local Veterans that attended the program along with Mrs. Adeline Cantu, Principal of Alto Bonito Elementary.